Celebrate the 10th Anniversary of Filipino Heritage Night, Presented by Tanduay Rum! 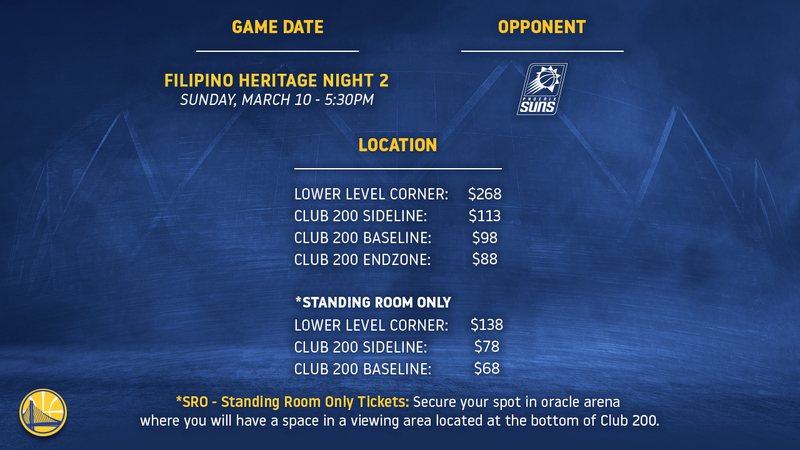 Join DubNation for Filipino Heritage Night 2, presented by Tanduay Rum as we celebrated the 10th Anniversary on Warriors Ground! Pregame Sharp Sunday Line Up - Enjoy live music on the Plaza while four local barbers line up four lucky fans in a battle of the blades! All fans have the chance to enjoy a FREE HAIR CUT provided by, the National Filipino Barbers Association. *Fans will be served on a first come basis until the conclusion of the event. Included with your ticket is a Filipino Heritage Night T-Shirt Giveaway. Redeem your giveaway item at section 214 from 4:00PM-End of Halftime. *Must have Special Event Voucher to receive giveaway item. A portion of each ticket sold will benefit local Filipino community partners. Rates can increase based on factors affecting supply and demand. Lock in your price and seat location by purchasing today!